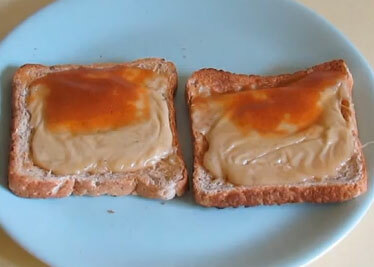 A classic recipe for a highly flavoured cheese on toast dish, Welsh Rarebit. Also known as Welsh Rabbit. This dish is thought to have originated in the 1700’s. beer – the more flavour in the beer, the better. If you don’t want to use beer you can use milk, an oil-based salad dressing or all three! Put your cheese into the top of a double boiler over a gentle heat. Add the mustard, salt and pepper. Once it starts to melt add just enough beer to make it into a thick paste. Add more beer if necessary once it has fully melted. 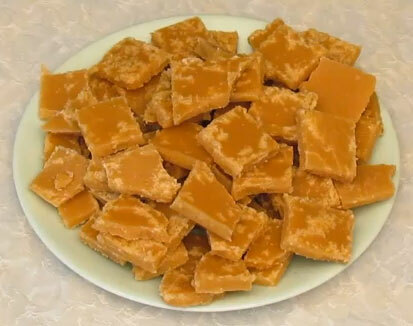 Old English Butterscotch recipe – the best butterscotch I’ve ever tasted made from a recipe from 1934. Crush it onto the top of ice-cream for a special treat, dip it in chocolate or eat it as it is! Cover a baking tray with foil and spray lightly with cooking oil (not olive oil, it will make it taste funky). Heat the sugar and water over a low heat until the sugar has dissolved and bring to the boil. Add a pinch of cream of tartar or a teaspoon of white vinegar and stir in. Heat until it reaches hard crack stage, which is 150 degrees C or 302 degrees F.
When it reaches hard crack stage add the butter and cream and stir in. Pour quickly into your tray. I was a bit slow in the video, which is why there is a grainy look on top where it had started to cool down. Leave until it starts to set and score some lines in it where you want to break it later. Leave overnight to cool, break into squares and enjoy!